Spring is in the air and so is snow... I know, wacky as it is.. it's true. A few days back when I came back from Orlando, I thought I would bring the warmth back with me. But, poor little me and my mere 125 pounds could make nary a dent on the chill in the North East. 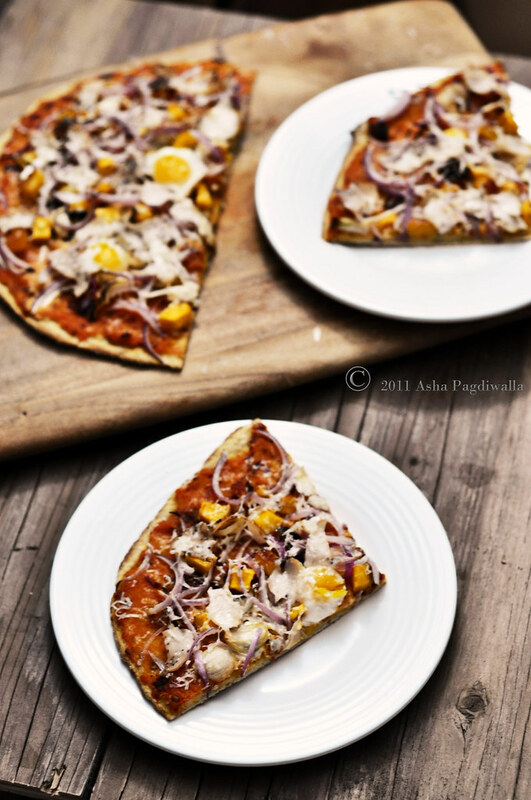 This pizza is really an ode to one of my favorite winter vegetables, Butternut Squash. There are so many great ways to eat it and roasting is just the simplest and easily best preparation. It does not need much more than a touch of salt to bring out the best in its flavor. Instead of the standard tomato base, I made a puree of roasted butternut squash spiced with chopped chipotles in adobo sauce and smoked paprika. The sweetness of the Winter squash (enhanced by roasting) is balanced nicely by the heat of the chillies and full bodied flavor of the paprika. 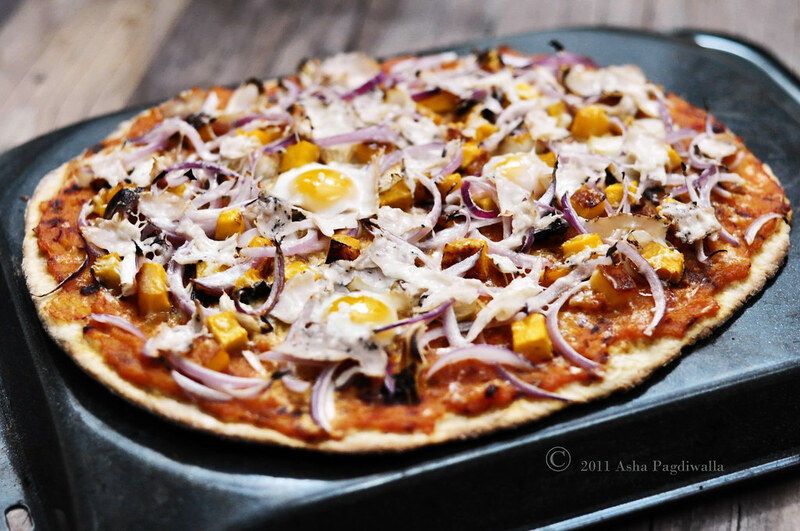 An homemade thin crust pizza topped with more chopped roasted squash, red onions, Bellavitano cheese and quail eggs is just the perfect, guiltless Sunday breakfast or even dinner, I say! 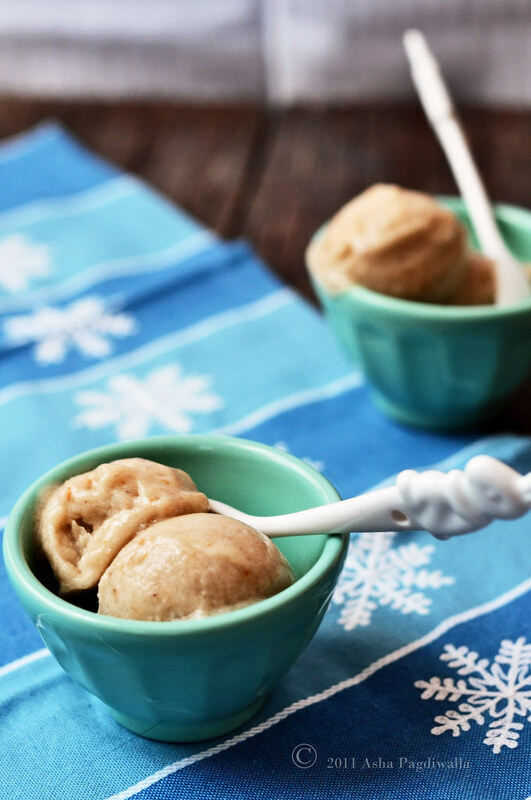 And, then rounding off with an easy, one ingredient, two step ice cream is my way of making Spring welcome! The idea of using aged cheese is that a little goes a long way in bringing flavor. Slice the squash into two halves. Remove the seeds of the squash. Retain one half as is. Peel and dice the other into half inch cubes. Wrap the other half in foil. Lightly toss the diced squash in very little oil and a touch of salt. Arrange on a sheet. Place the wrapped half as well on it. Bake at 375 F for 20 minutes. Let the squash cool for a bit. Unwrap the foiled half and scoop out the flesh. Mash well. Mix in the paprika, adobo sauce, chipotle and mash together with the cooked squash. Season as needed. Increase the oven temperature to 500 F. Roll the dough out as thin as you can. Lightly brush with oil. Spread the squash puree over the dough. Distribute the roasted, diced squash, onions and cheese over the pizza. Crack the eggs and distribute them around. Bake for 7-8 minutes until lightly browning on the edges. Remove to board, slice and enjoy! Stir together the dry ingredients, including yeast, in a large bowl. Add water and olive oil, stirring mixture into as close to a ball as you can. Knead the dough for a minute or two until it forms a smooth, tacky dough. Lightly oil the bowl, put the dough back in, turn it over to coat all sides. Cover the bowl with plastic wrap and leave it in a warm place till it doubles in size. When the dough has risen, on a floured surface gently degas using the balls of the your palms. Fold the dough into an approximate ball shape, and let it sit under that plastic wrap for 20 more minutes. The dough will be pretty elastic so you can stretch it bit and fit into a ball shape. It will retain shape once formed. After about another half hour, the dough will be ready to be rolled out into a thin pizza base.